Graffiti is one of the most free art expressions of the world; you don’t do it for money nor for an institution, it’s free expression and it liberates yourself creatively from a lot of restrictions. i recently returned from a brief sojourn to south florida. the purpose of the trip was to attend the wedding of a nephew. it was a great trip - there was a nice mix of visiting family, chilling at the beach and poolside, exploring new places, eating good food, and meeting new people. the wedding on saturday and friday night's pre-wedding activities were fabulous - in fact, so much so that i am rethinking my general curmudgeon attitude about weddings. how can i not love a wedding which takes place in a beautiful japanese garden, where the two main readings are dr. seuss's oh the places you'll go and bob dylan's forever young, and where the female attendants are wearing green dresses of their own choosing, not to mention a wedding which has the cake is topped with monsters instead of those plastic bride and grooms in formal and traditional attire. because of air fares we were better off by flying down on thursday and returning on monday, this worked out well as we had time for a mini-vacation. in spite of being born in florida and having lived there only several months as an infant; i only have been to florida once and that was only for about eight hours several years ago - and for that trip i solely wandered around south beach looking at the architecture and all the beautiful people and visiting with friends who had recently moved there.. as with weddings, until this most recent visit my general attitude about florida has been pretty grumpy (too hot, too humid, too many bugs) - and as with weddings, i am now rethinking my earlier biases! i now understand the allure of the sunshine state. the wedding was held in delray beach, a charming beach town on the atlantic ocean. friday and saturday we had plenty of time to explore the area and also get in some quality lounging about. as delray is less than an hour north of miami on sunday after checking out the delightful wright by the sea resort where we stayed, we headed to the big city to spend the day wandering around. unfortunately the stormy (read torrential rains) weather prevented us from taking our planned walking tour of the art deco district of south miami beach, however, we did enjoy a bit of the architecture by driving around and looking at the buildings through rain streaked windows. after driving up and down collins avenue and adjacent art deco laden streets we left the island miami beach is located on and took the causeway over to miami proper. 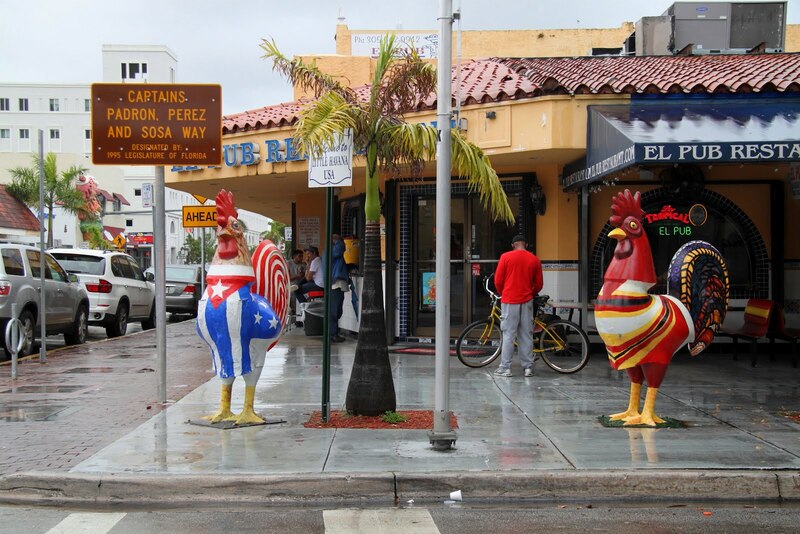 first stop in miami was to eat a late lunch in little havana at versailles. normally i'm suspicious of places that tout themselves as the 'world's most famous such and such --in this case, "the world's most famous cuban restaurant" -- but versailles was recommended to emma by a friend who lived in miami for many years and appreciates good food. what can i say, after eating at versailles, i must say there is just reason for such a grandiose claim to fame! after lunch the weather calmed down and the rain lightened up enough to leave the comfort of being inside a building or car. upon leaving the restaurant we drove through the little havana district checking out the giant chickens (or roosters) and street art. little havana may have had some decent murals, but we heard that the real mecca for edgy street art/graffiti in miami is in the wynwood art district. 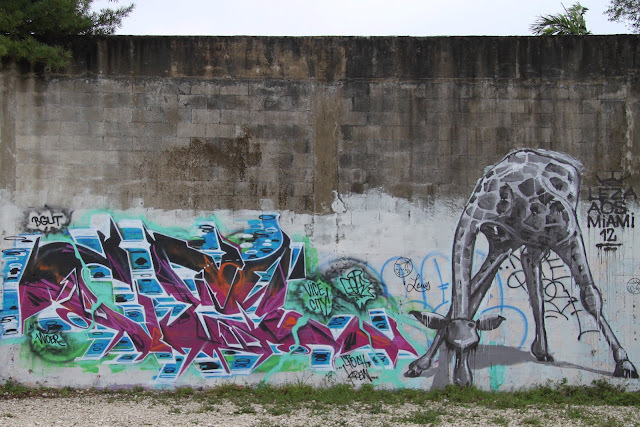 in fact, street art/graffiti is so pervasive in wynwood there are even street art bike tours! unfortunately, i learned about this too late - however, if i ever return, you can bet i will find a way to schedule this activity into my itinerary! our wanders in wynwood barely scratched the surface on all there is to see! we pretty much aimlessly wandered around wynwood - and only through dumb luck did we happened upon the fantastic giant manatee by roa in the top photo. 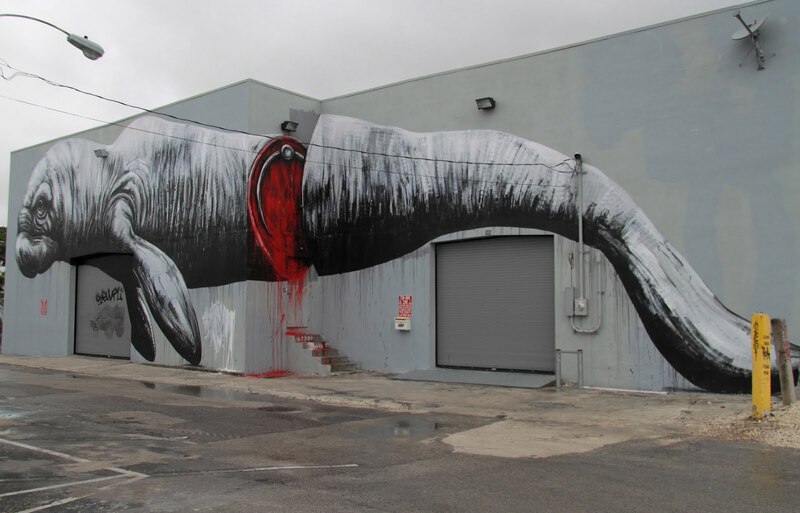 what i love about this piece is how roa artistically editorializes the most pressing human related threat to these gentle sea cows - injury and death caused by collision with watercraft. the acclaimed actor john lithgow wrote a book and song in praise of the gentle and very threatened manatee - the book and song is entitled i'm a manatee -today's vid is by a youtuber named hugh having puppet fun with john's song. I've never visited Wynwood, as it "happened" after I left Florida. But the next time I get to Miami, I'll be sure to check it out! I love the giraffe piece -- I've never seen a photo of that one. I'm skeptical about Versailles' claim, too, though I've never been there -- what about the Columbia in Tampa? What about the modest but fabulous El Siboney in Key West? Oh, I guess the Columbia is Spanish, not Cuban. I like the "cake monsters" too! It sounds like the bride and groom had good humour, and good friends. Congratulations and all the best to them in their life together. As always, love the artwork! 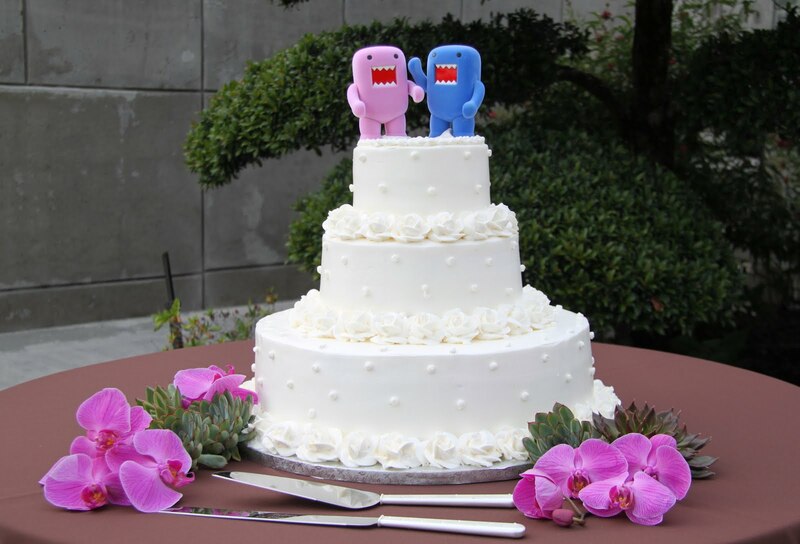 Nice wedding cake, they were the cutest monster I've ever seen. Nice post, thanks for sharing this to us. I've always wanted to visit Miami, glad you got to spend some extra time there.